Today’s Crafty Chat is all about keeping it simple, which is why our guest is the Queen of Clean – Julie Ebersole. Julie blames her card-making addiction on her cousin, who introduced her to it more than 20 years ago. Since then Julie has done it all, and is a stamp and die designer as well as an educator at Ellen Hutson. 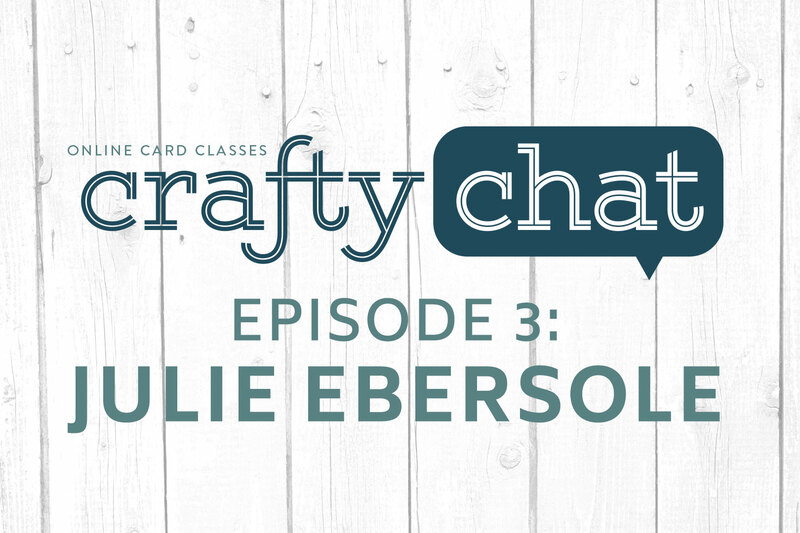 Julie is also an Online Card Classes contributor, and blogs at Paper Trufflez. Even though her style is clean and simple (CAS), keeping things simple isn’t always easy for card designers, and Julie reveals some of her tips, tools and techniques for making the most of clean designs. What a great concept “visual vocabulary” is! I’ll be more aware of expanding that kind of vocabulary. Also the talk about where to start when making a card (colors, sketch, images) was inspiring too. I have just loved these chats. What a bonus to Online Card Classes. I have enjoyed each one so much. Thank you, thank you, thank you for giving of yourselves to what I am certain is a very big audience. Really love this series. What a great way to get to know the inspiration, tops tips and styles of so many great crafters. I do love these chats and I love Julie and her cackle – if I’m having a bad day I play one of her videos just so her laugh can cheer me up! So loving all these chats girls and not only are they inspiring but they are educational! And Julie, your laugh is your light and it brightens everybody’s day! Never lose that girl! I always look forward to hearing Julie laugh in a video. This is such a great series! Oh how I love these chats. I have no idea how I missed that these were available but now I am just holding up my index finger and saying, “in a minute” to my husband. So when I said.. this is Julie Ebersole my husband said… the one with the awesome laugh? LOL!!! I love that he listens even when he is pretending to watch college football. LOL!!!! Thanks… these are great! I always love to hear Julie’s laugh in the Hello Monday videos. It was great to see the face and learn more about the person that goes with that laugh. Thank you Ladies for this lighthearted and yet educational chat. It was fun to watch you have fun! These chats are so fun and fascinating and I’m having a great time looking at them all. I’ve just discovered them and it’s my treat for the day to look at one. It reminds me of taking an online card class. I am learning so much from these chats! And the “sparks” are flying in my head with ideas and things to try. Thanks! I’m so grateful for these chats. I started following Jennifer last fall and then she had Kristina guest for her. Well, it snowballed from there. I loved to scrapbook, but when I saw the cards, well, the rest is history! I have been taking some of the classes and learning so much from watching your YouTube videos and following your blogs. I admire all of you so much. Thank you, thank you, thank you! I feel like you all are in my kitchen having a cup of coffee with me while we talk crafts….I love the craft chat….